No tomato left behind. That’s my gardening motto. Every year, I “farm” in my Brooklyn backyard. The crop that likes me best is tomatoes. In the spring, I’m full of hope, I pour over the Silver Heights farm catalog of hundreds of organic veggies which is pretty much like reading food erotica. I fantasize about them, much the way I’d imagine people who are looking for love or a hook up do on dating websites do about their prospects. There are no pictures in catalogue so I have to let my imagination paint a picture from their description. I want to order all the “uppity” tomatoes. I coined that name over the years because they lead charmed tomato lives. They are carefully cultivated by Trina and her team under optimum conditions at her farm near Narrowsburg, New York. Each tomato lives it’s own little pot, hanging out in the greenhouse with it’s mates, watered and pampered, until they are ready to be sold. I manage to control myself and buy only 15 - 20 plants because I have to leave room for my favorite tomatoes of all. The mystery volunteers that crop up from the compost or the garden every spring. I have a lot of respect for the scrappy tomato plants that seem to find their own way in life. I pot every one of them up. I plant some of them amongst the uppity ones. It’s a bit of a surprise party because you never know what they’ll turn out to be. I also give them away. I post a note on my neighborhood Yahoo newsgroup and my social media channels. People love to get FREE plants and I like to give them. I get very disturbed about the idea any tomato plant being unplanted and homeless. NO TOMATO LEFT BEHIND! The volunteers are tougher than some of the uppity tomatoes. By summer, I’m full of contempt. The charm wears off the ritzy tomatoes as some of them inevitably drop dead. Oh, every once in a while they actually produce a lousy fruit or two, but my dream of bountiful salads and-or jars of these canned beauties shrivels up and withers away exactly like they do. I do the math—$3.50?!?!?!? for one way-too-precious little tomato? I feel like I’ve been suckered as I yank them out. I replace them with more volunteers who have been waiting in the wings. In July, I always find a gangly volunteer or two that I missed growing sideways in the garden. I pop them in the grave of the uppity tomato and all is well again. The volunteers are a lot hardier and push on until the frost. By the time the weather threatens the crop the objective again is what to do with the tomatoes? NO TOMATO LEFT BEHIND! I always have a healthy bunch of ripe and unripened tomatoes. I always turn some of the green tomatoes into 4G Chutney. Others get fried them or pickled whole. I especially like to pickle the cherry tomatoes. This year, I made a Twice Tomato, Triple Onion, Four Herb Salad. 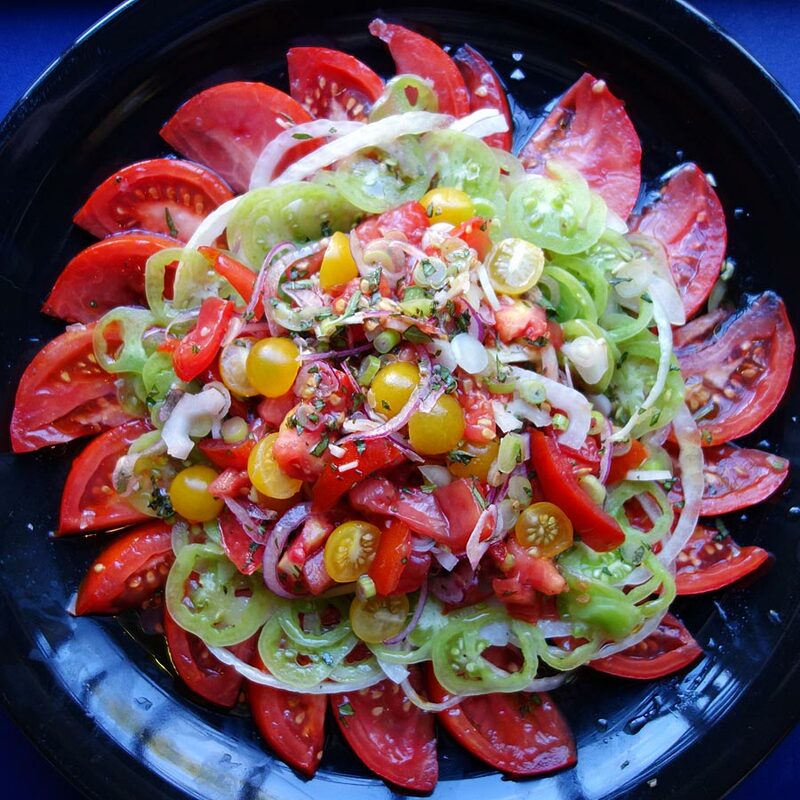 It’s a fun, beautiful and delicious solution for using up green tomatoes and even the fresh herbs from my “farm”.